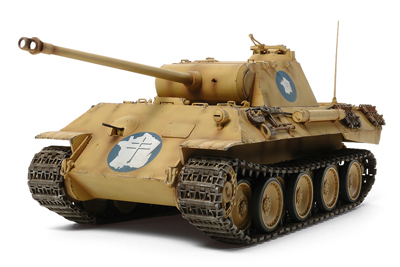 1/25 Tamiya Panther G Model Kit Discounts Apply ! TAM30612 - Tamiya 1/25 Panther G Model Kit. The Tamiya Panther G model kit includes moveable suspension utilizes plastic torsion bars and pre-assembled tracks. Kits also contains 3 sets of markings to depict German vehicles, plus a new marking option to allow the depiction of a Free French Forces tank. Discontinued Item By Tamiya.